What do we strive for in our lives? Instead of happiness or success, how about Thriving? When evaluating our lives, we more often turn questions inward: What is my purpose? What does it mean for me to live a good life? What should I do with my short time being alive? But a good life inherently includes both inward aspects (y-axis) and outwards aspects (x-axis). It’s the combination that makes life worth living. Success. We all want success, right? But success at what? We seek career success, at times, but not when it comes at too great an expense of other life objectives, like family or health. We typically think of success as financial or career success, but most people agree that this isn’t the best overall objective for a life. As a result, leaders seek to redefine success to encapsulate broader notions of a thriving life. But the terminology comes up short for me as an overarching goal. Success means achievement of a goal — success in our careers, success in our athletic training, success in our relationships. But as an overarching life goal, I’m not seeking success, per se, I’m seeking some broader notion of a prosperous and growing life, that includes success but also includes much more. Happiness. Happiness is one of the most widely cited purposes of life. We want to be happy, we want our children to be happy, we want friends and family to be happy. After all, Aristotle called ‘happiness’ the chief good, right? While happiness is a worthwhile goal, at times, it is not the only goal and should not dominate other objectives. Parenting does not make us happier, but most parents wouldn’t make a difference choice (to the contrary when they end up having more kids!). Sometimes you sacrifice happiness in the short run in order to make a meaningful contribution somewhere. That may increase your overall satisfaction or fulfillment with life, but not happiness necessarily. Thought experiment: would you take a pill that made you perpetually drugged but happy? If so, what’s stopping you? When we admire great lives (e.g., Mother Teresa, Martin Luther King Jr, Abraham Lincoln), we don’t admire them because they were the happiest. We admire them because they sacrificed their own personal happiness for the greater good. We don’t have to be Mother Teresa to understand that part of our life purpose goes beyond selfishly increasing our own happiness. Purpose. Purpose is helpful in persevering in the face of challenges. You might be down or depressed, but if you have a greater purpose, you can make it through. People find purpose in child rearing, religion, charity, and a whole host of other activities. Some purposes are good, and others are bad — if we find purpose in human suffering, is that a purpose worth striving for? Purpose is an energizer, a kick-starter, a multiplier, but not an adequate end in itself because it doesn’t separate good purposes from bad purposes, so it’s inherently ill-defined. Progress. Progress feels good. Such a fundamental human need, feeling productive and making progress. Progress can get you out of a rut. Feeling stuck can be paralyzing and demoralizing. Progress is a necessary element of human thriving but is no means complete. We can’t simply progress, for its own sake, marching right into death. We need to combine progress with purpose and other elements of a good life in order to achieve a broader overall objective and definition. Achievement. Achievement is easy to obsess over. It is tangible. We can rack up trophies on the shelf. We can hang our achievements on the wall. We can post our achievements online into the minds and hearts of everyone we know. But what for? We don’t take trophies with us to the grave. Will anyone ultimately care if we did or didn’t achieve a particular goal in life? There is a definite science to achievement: perform steps 1, 2, and 3 and you will achieve. But achievement does not provide fulfillment, happiness, or necessarily even human thriving. Achievement is great for short-term goal pursuits, but does not and should not define our lives. Contribution. Making a positive contribution to the world is another necessary element of a thriving life, but also incomplete. We can moderate between focusing inward on our own growth and happiness, and focusing outward on the growth and happiness of others. We can contribute in small ways (e.g., listening to a friend in need) or in big ways (e.g., starting a charity, working in public service). But contribution alone leaves us wanting because it lacks individual growth and prosperity. We can give and give, but if we never receive we can feel empty. Contributing to others feels good and increases our own well-being, so there are selfish benefits to giving, but contribution alone without individual growth will leave many of us — maybe most of us — dissatisfied. Devotion. Devotion is similar to contribution, but doesn’t necessarily require a broader impact. We can devote ourselves very narrowly to a child or a spouse, or even art or a cause. Ultimately, devotion can be a pathway to purpose and happiness. We can devote ourselves to religion or spiritual growth in a way that is all-consuming. Devotion gets us into Flow, which can be soothing and spiritual. From the Harvard Happiness Study, The Talent for Aging Well: “Don’t try to think less of yourself, but try to think of yourself less.” But is devotion the definition of a good life? It might be one way to pursue or facilitate certain components of a good life, but not something to exclusively aim for, in and of itself. All of the elements above are worthwhile objectives. They are ideas and passions that I can get behind. But they don’t feel complete. Should we strive for a successful life? A happy life? A devoted life? To me, each of the above aims, by themselves, fall short. Instead, we need to embrace broader notions of what it means to live a thriving human life. 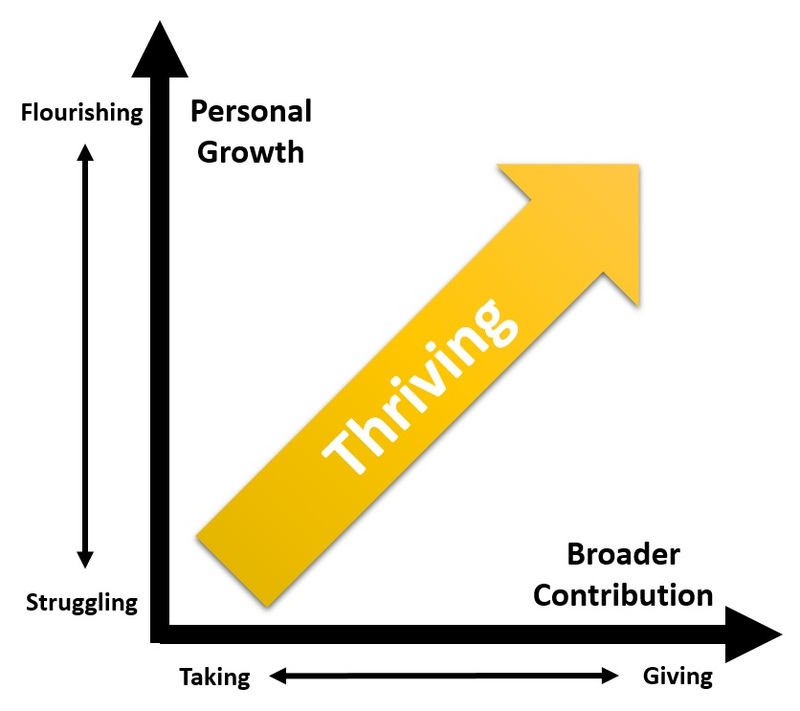 Thriving combines personal growth (living, growing, progressing) with broader contribution (giving, devotion, growth of others). Personal growth includes elements of success, happiness, and achievement. Broader contribution includes making a positive impact on the world by pursuing truth, morality, and the well-being of others. Thriving is a term that is taking off. Ariana Huffington’s Thrive: The Third Metric and Thrive Global are some salient examples. See also Thrive Health, Thriving Family, Thrive Life. But it’s more than just nomenclature. It represents the cultural movement that’s focusing on meditation, yoga, organic foods, work-life balance, the four-hour workweek, social media, B Corporations, responsible capitalism, and Feel the Bern. It represents a rejection of the overworked, overstressed, you-can’t-have-it-all lifestyle that we feel pressured to pursue. All of these movements recognize the importance of personal success and achievement, but they don’t pursue them as the overarching goal. We can embrace personal thriving, family thriving, and societal thriving, all of which make our world a better place. How can we live a good life, a beautiful life, a life worth living? Let’s strive to thrive. Originally written: October 2016. Republished: February 2018.